There was once a time where the United States Hockey League wasn’t considered a major developer of talent. Sure, they hosted the United States National Development Program’s under-18 touring team, but the league’s clubs were effectively the Washington Generals to the USNDP’s Harlem Globetrotters – hardly a force to be reckoned with. However, the USHL has slowly but surely developed into a very strong proving ground for young players. The 2017 NHL Draft was another occasion where the USHL raised the bar. In prior years, typically the players drafted from the USNDP would dominate the conversation around the USHL’s draft. Perhaps a team or two would have a player taken. In the 2017 Draft not only were 40 players from the USHL selected, but players from every single USHL club were nabbed during the seven-round draft. The league produced four first round selections: Green Bay’s Casey Mittelstadt at 8th overall, the USNDP’s Josh Norris at 19th overall, Waterloo’s Shane Bowers to Ottawa at 28th overall and Sioux City’s Eeli Tolvanen to Nashville at 30th overall. If the 2017 NHL Draft isn’t a statement on the USHL’s strength as a developer of talent, it was certainly a statement on the depth of talent in the league. 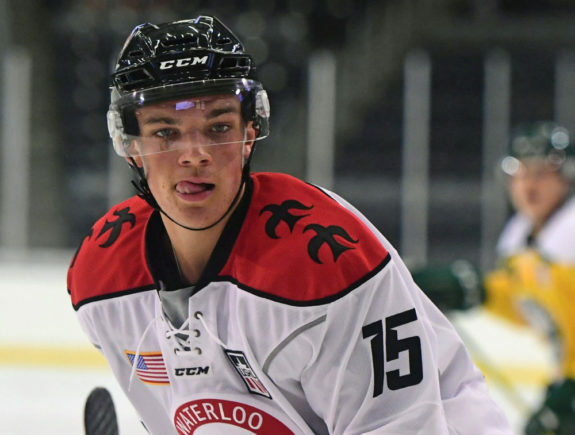 Rather than being known as the league where the U.S. National Development Team plays, the USHL has quietly developed itself into the fourth major-junior circuit in North America and a league every bit as strong as any of its Canadian counterparts.